In this chapter we study different classes of maps between one or two K-vector spaces and the one dimensional K-vector space defined by the field K itself. These maps play an important role in many areas of Mathematics, including Analysis, Functional Analysis and the solution of differential equations. 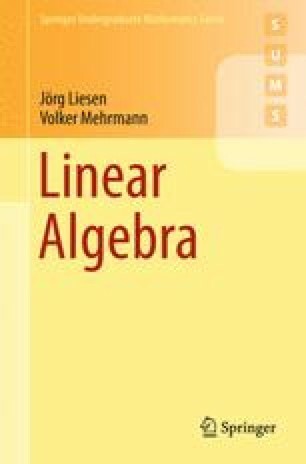 They will also be essential for the further developments in this book: Using bilinear and sesquilinear forms, which are introduced in this chapter, we will define and study Euclidean and unitary vector spaces in Chap. 12. Linear forms and dual spaces will be used in the existence proof of the Jordan canonical form in Chap. 16.